Abstract: We look at the events surrounding the bitcoin price rally in June 2011 to $32 and the following temporary flash crash down to $0.01, on the MtGox exchange. We look at the incompetence of MtGox and examine the causes of the crash. We then look at the political battle and uncertainty which occurred in the aftermath of the crash. If one likes price volatility and scandals, the summer of 2011 was an exciting time for Bitcoin. Over the course of a few days, bitcoin plummeted in value from a peak of $32 to just $0.01 on the MtGox exchange, a trading platform based in Tokyo, which was dominant at the time. This was after a recent rally, with bitcoin trading at around $2 a couple of months earlier. The crash down to $0.01 is now a famous part of Bitcoin history. In this piece, we look at the cause of the crash and its aftermath. Although the major exchange of the time, MtGox, was shown to the community to be largely negligent, which may not have been the best advertisement for Bitcoin. In our view the engaging nature of the events which occurred that summer, ironically made a significant contribution to the level of interest in the space. There was significant uncertainty surrounding the hack at MtGox which caused the June 2011 price crash and the issues surrounding it were never fully explained. The Bitcoin community was riddled with rumours about whether MtGox was solvent and how much bitcoin was stolen. Thanks to a report published in 2017 by Kim Nilsson, we now have a relatively strong understanding of what occurred in 2011 and the damage that this caused to MtGox. Ironically, despite the huge impact on the market and the company’s reputation, in terms of MtGox’s solvency, this event was largely insignificant compared to other security incidents. For many however, a new window into MtGox was opened up, which illustrated a severe lack of monitoring systems, governance, controls and security measures. The table below lists some of the major security incidents at the MtGox exchange, with the June 2011 hack highlighted in green. This incident may have only directly cost the exchange 2,000 bitcoin, an inconsequential amount, compared to roughly 837,000 bitcoin of total losses. A hacker obtained the main wallet.dat file again and began withdrawing funds in October 2011. MtGox appears not to have noticed this. A software bug caused funds to be sent in such a way that they could not be redeemed. In the weeks leading up to 19 June, many users of MtGox were reporting that their accounts had been hacked. At around the same time a database of MtGox users, including an MD5 hash of their passwords (with an unclear/inconsistent salt policy) was leaked and made available. Many passwords were identified. Some traders used the same credentials at the rival exchange, Tradehill, who also experienced security issues. Despite this, MtGox did not suspend trading, a decision which many traders questioned. 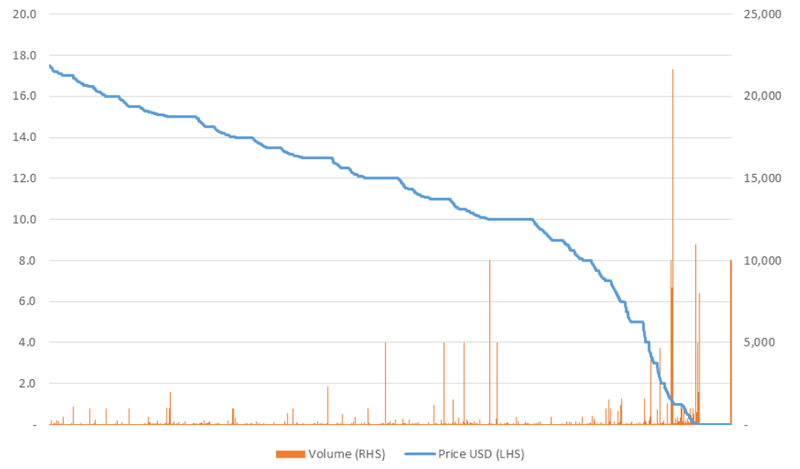 On 19th June 2011 (3am on 20th June Tokyo time), there were large sell orders on the exchange and the price crashed from around $17.50 to $0.01 and trading continued at this level for several minutes before recovering. This lead to a high degree of uncertainty, with some assuming there may be a problem with the Bitcoin network. It now seems likely that what actually happened was that a hacker may have obtained access to the account of Jed McCaleb, the founder of MtGox who sold the exchange to Mark Karpeles around three months earlier. This account appears to have retained administrative rights to the database and therefore the hacker was able to manipulate account balances and grant themselves a large number of bitcoins on the MtGox system. The hacker is the likely to have begun selling some of these coins. Due to the poor management of MtGox, in our view it is unlikely that the company were aware of this, even in the aftermath of the hack, and therefore the explanations provided at the time of the events were incomplete or inaccurate. At the time, MtGox had a daily withdrawal limit of US$1,000, this applied to both bitcoin and USD (via Dwolla). This meant that the hacker (or any others who benefited from the hack by buying bitcoin at low prices), would be unable to benefit by withdrawing the funds, except within the US$1,000 limit. However, the US$1,000 bitcoin limit was based on the market price of bitcoin on the platform and since the price fell to $0.01, in theory the maximum each user could withdraw was 100,000 bitcoin, certainly not a small amount. Mark then mentioned that only 2,000 bitcoin were withdrawn in the aftermath of the event, which was a relatively positive result for MtGox. There was widespread scepticism about this number at the time, with many believing much more was stolen. Ironically, this 2,000 bitcoin figure now seems about right, although MtGox had lost far more in other incidents. However, due to the price crash and suspension of trading, this incident was very public at the time and resulted in the incompetence of the MtGox platform being exposed to the community. The bitcoin will be back to around 17.5$/BTC after we rollback all trades that have happened after the huge Bitcoin sale that happened on June 20th near 3:00am (JST). One account with a lot of coins was compromised and whoever stole it (using a HK based IP to login) first sold all the coins in there, to buy those again just after, and then tried to withdraw the coins. The $1000/day withdraw limit was active for this account and the hacker could only get out with $1000 worth of coins. Apart from this no account was compromised, and nothing was lost. Due to the large impact this had on the Bitcoin market, we will rollback every trade which happened since the big sale, and ensure this account is secure before opening access again. After this announcement there was significant debate in the community as to whether the rollback should occur. Obviously many participants in the debate had a financial interest in the outcome and this was no doubt effecting their views. In many ways, there were some parallels between this rollback and the 2016 DAO “rollback” on the Ethereum network, with some similar arguments being made. Most traditional exchanges tend to roll back trades in exceptional circumstances, particularly if trades occur at extremely unusual prices. The prices in this instance were certainly extreme. The bitcoin were stolen and therefore users should not benefit from stolen goods. The bitcoin may never have existed and may only have been entries in MtGox’s database and therefore it may not be possible to deliver the coins. MtGox should take responsibility and compensate all parties involved. In particular MtGox did not act appropriately in the weeks prior to this event when many users reported that their accounts were hacked and they allowed trading to continue. MtGox had no policy with respect to the matter and should therefore honour the trades. If MtGox reversed the trades in this case, then users may not trust them again. Reversal is an arbitrary process, would MtGox reverse trades if a much smaller amount of money was stolen? This is one rule for the rich and another for the poor. Although there are some examples of major traditional exchanges reversing trades in exceptional circumstances, there are examples where they have not done so. Honouring the trades is more consistent with the no bailout, dog eat dog, 24×7 uptime, immutability type culture in the community, which was in some ways more prevalent at the time than it is today. The community appeared to be split on this issue, with some even favouring a vote to decide. Kevin then went on to explain the likely reason behind the price crash, which was that the seller was trying to manipulate the price down so that they could withdraw more coins within the US$1,000 limit. In our view this part of Kevin’s story is likely to be an accurate explanation for the price crash. This logic contradicts the claim from MtGox that the person who conducted the hack was also the buyer of the bitcoin. However, some have doubted the accuracy of Kevin’s story, claiming the volume of trades he claims is not consistent with the MtGox feed. The feed appeared to show trading volume of only 55,000 bitcoins during the crash past $0.0101 and only 238,000 bitcoins traded in the period. Only 3,000 bitcoin seem to have been traded at the $0.0101 price. These figures are lower than those implied by Kevin, although Kevin’s trades could have been excluded from this data for a variety of reasons. The feed was also notoriously unreliable and it was not clear if there was a precise definition of some for the information in the feed. In our view, there is no reason to believe the whole truth of any of the parties involved in this incident, but Kevin’s explanation for the crash itself seems plausible to us. The MtGox exchange was down for several weeks and many users were becoming anxious about the solvency of the platform. There was uncertainty over the amount of bitcoin which were lost and users were concerned about a run on MtGox, eventually leading to the exchange going into liquidation and users losing funds. In an attempt to reduce some of these concerns, as the chat log and bitcoin transaction show below, MtGox attempted to prove it had access to a significant quantity of bitcoin, by conducting an onchain transaction on 18th July 2011. At the time, the above action seemed to settle the nerves of many of the traders. A few weeks after these events, after many false starts, trading at MtGox eventually resumed and the bulk of the trades were reversed. However, to this day, as far as we are aware, MtGox has not been able to provide a coherent explanation for what occurred. The lack of a consistent narrative from MtGox lead many to believe that MtGox had poor monitoring and controls of its systems and that the company was run negligently. Many concluded “never to trust MtGox again”. Unfortunately, however, MtGox somehow continued to dominate the exchange ecosystem for another three years. However one views the conduct and transparency of some of the platforms and players in the ecosystem today, we can at least conclude that things have significantly improved since 2011.